…The Aotearoatanga mourning flag is the mourning version of the Aotearoatanga flag (especially if adopted as a national flag). The mourning flag would, thus, be flown instead of the national flag in times of mourning. …The flag is based on the Aotearoatanga (national) flag. However, its background is black, representing a time of mourning (in Western cultures). 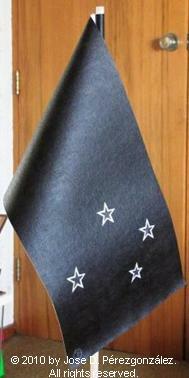 The background of the Southern Cross stars is also black, but the outline of the stars and their placement on the fly remains unchanged.